Author: Hebert, Ernest Set In . . . In 1746, Nathan Blake, the first frame house builder in Keene, New Hampshire, was abducted by Algonkians and held in Canada as a slave. Inspired by this dramatic slice of history, novelist Ernest Hebert has written a masterful new novel recreating those years of captivity. 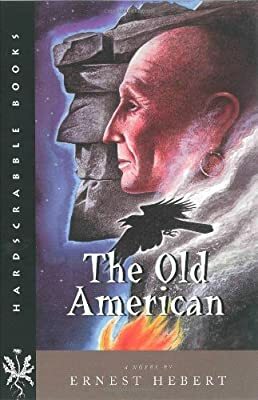 Set in New England and Canada during the French and Indian Wars, The Old American is driven by its complex, vividly imagined title character, Caucus-Meteor. By turns shrewd and embittered, ambitious and despairing, inspired and tormented, he is the self-styled "king" of the remnants of the first native tribes that encountered the English. Displaced and ravaged by disease, these refugees have been forced to bargain for land in Canada on which to live. Having hired himself out as interpreter to a raiding party of French and Iroquois, Caucus-Meteor returns from New Hampshire the unexpected possessor of a captive, Nathan Blake. He decides to bring the Englishman to his own village rather than sell him to the French. Ambivalent about his former life, Blake gradually fits into the routine of Conissadawaga. Meanwhile, Caucus-Meteor struggles to protect his people from the rapacious French governor. Constantly plotting and maneuvering, burdened by responsibility, the Old American exhibits cunning and courage. A gifted linguist who was forbidden to learn to read or write; a former slave who is now a king; a native leader who has seen more of London and Paris than his English captive, who knows more of European politics than the French colonial administrators, Caucus-Meteor is a brilliant, cantankerous, visionary figure whom readers will long remember.